After the phenomenal success of The Fault in Our Stars, author John Green returns with another heart-warming tale in PAPER TOWNS, available on Blu-ray™ and DVD October 20. Join rising stars Cara Delevingne and Nat Wolff in the breakout performances of their careers as they go on an epic journey of love and adventure. 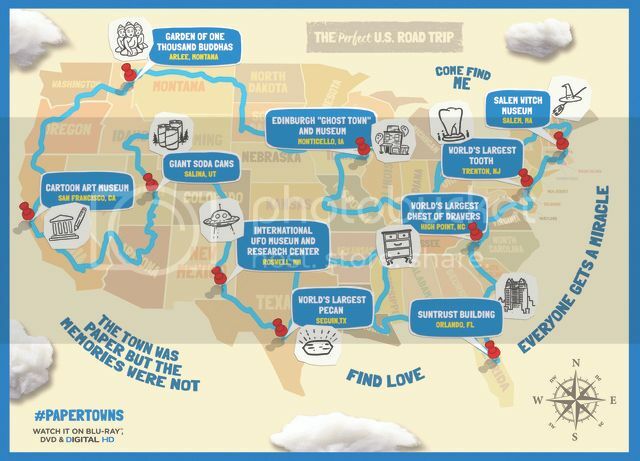 For a limited time only, get your Paper Towns fan pack Blu-ray with collectible packaging including shareable sticky notes of inspirational quotes from the film and a U.S. map! Adapted from the bestselling novel by John Green, PAPER TOWNS is a coming-of-age story centering on Quentin, a high school senior who has been in love with his enigmatic neighbor Margo since childhood. After taking him on an all-night adventure through their hometown, Margo suddenly disappears--leaving behind cryptic clues for Quentin to decipher. The search leads Quentin and his quick-witted friends on an exhilarating adventure that is equal parts hilarious and moving. Ultimately, to track down Margo, Q must find a deeper understanding of friendship--and true love. The PAPER TOWNS Blu-ray comes with nearly an hour of deleted scenes from Q and Margo’s journey, commentary from the director and Green, and exclusive behind-the-scenes featurettes. Watch a never-before-seen gag reel and learn more about the making of the film from the actors, filmmakers and Green in a three-part documentary. Take a road trip with the author and cast, watch the stars engage him in lightning round interviews and see how much fun they all have when the cameras aren’t rolling! Calling all book nerds! 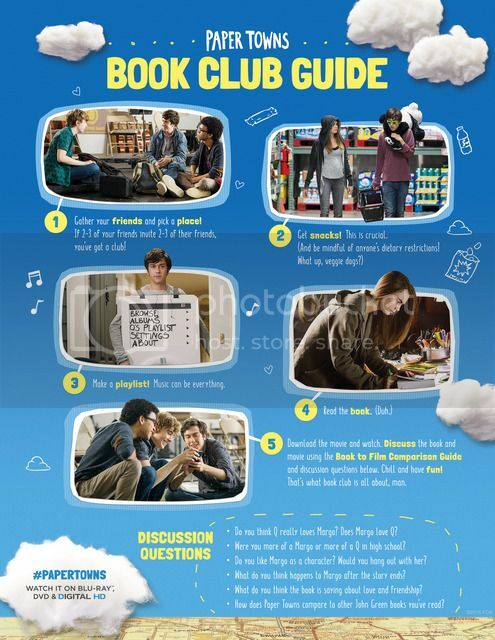 Check out the above book club guide! 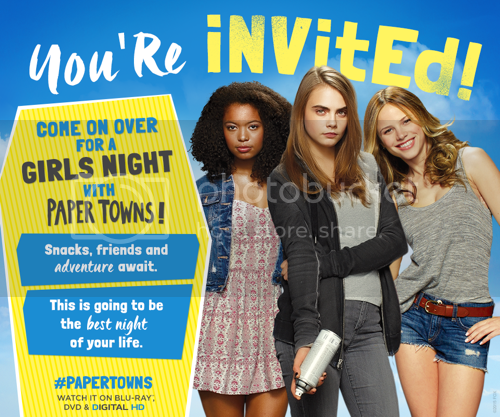 If you are looking for a night in with the girls, you could do a John Green Marathon with Paper Towns and The Fault in Our Stars. Get the popcorn ready! · Alternate Scene: "Shake It Off"
Disclosure: I am a Fox Home Entertainment Insider. I will receive a copy of this movie for posting.. No other compensation was received and any opinions expressed are my own.